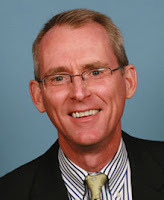 --Bob Inglis, former Republican Congressman, S.C.
Former Congressman Bob Inglis is part of a growing movement of conservative Republicans who view "Trumpism" with more than just alarm. The group's leaders include Evan McMullin, who ran in 2016 as the “Never Trump” presidential candidate, and Bill Kristol, co-founder of the Weekly Standard, and conservative columnists Mona Charen and Max Boot. They have issued a statement calling on House Speaker Paul Ryan and Senate Majority Leader Mitch McConnell "to make clear, both publicly and privately, that they support the Mueller investigation and regard any interference with that investigation, including dismissal of the special counsel or preemptive pardons of investigation targets, as completely unacceptable." They have become especially concerned that months of attacks on Mueller’s integrity in the Rupert Murdoch-owned Fox News, Wall Street Journal, and New York Post might goad or inspire Trump to fire Mueller and thus spark a constitutional crisis. And respond they did, taking the high moral ground against Trump: "It is morally imperative that the Republican Party and the conservative movement stand as bulwarks of the rule of law, not enablers of its erosion and violation. Now is the time for choosing." The Republicans need their cherished tax cuts for the rich, and for corporations, first. Once many of their destructive goals are in place, they will be more amenable to holding Trump to account for his high crimes and misdemeanors. Both parties lost their souls long ago. And there it is -doesn’t take long for the both-sides-do-it meme to emerge. Please. Yes, there are soulless people in both parties, but right now it’s a pretty one-sided affair. And which side is that, Betty ?